I find it quite hard to believe it’s October tomorrow. It’s less than two weeks until my 35th birthday, and it’s less than 24 hours until this years’ Blogtoberfest! If you’ve followed me for a few years you’ll know I like to take part every year, although I am yet to actually achieve daily posting for the whole of October! I’ve been thinking about blogging of late, about why it is that I go so few and far between posts when I’d really like to update several times a week and arrived at the conclusion that it’s the photos. I don’t have a fancy camera, my camera, a canon point and shoot, takes reasonable photos outside, but most indoor photos need a bit of work, and I like to frame or collage them. This takes time, time which I would rather use on other things, like sewing and playing with Elijah! So I’ve decided that since this isn’t remotely a photography blog I’ve decided that it’s fine to post photos that I’ve quickly run through picmonkey or an app on the good on iphone. If I have something I’m particularly pleased with I might run it through photoshop, but I bet we won’t be able to see much difference anyway (aside from consistent font use!). Let’s see if this helps me blog more! 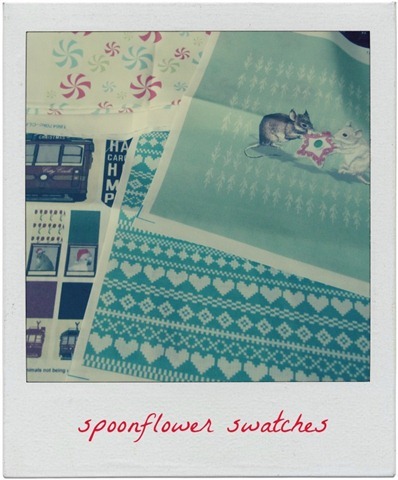 These swatches arrived a few weeks ago from spoonflower. They’re the small swatch size and I can’t wait to use them in my Christmas projects!